Mrs. Obama traveled to the North African country with her daughters Sasha and Malia and mother Marian Robinson to promote her education initiative "Let Girls Learn." She arrived in Morocco wearing a $1,750 designer dress and ended the night with a "lavish dinner" with Princess Lalla Salma and actress Meryl Streep. Two contracts were signed for rooms at the Royal Mansour worth $50,000 and $10,073. The five-star hotel has a mother-daughter spa suite, promises its guests "wonder, luxury and unparalleled services," and offers a "spiritual spa journey." Aside from hotel and motorcade costs, the Daily Mail estimates that flights for the trip totaled $300,000. 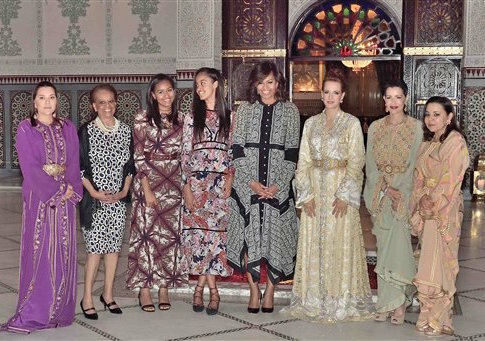 Morocco was the second stop on Mrs. Obama’s three-country visit. Obama first traveled to Liberia, and headed to Madrid on Wednesday to promote girls’ education. People.com noted, "The exciting trip closely follows Malia's graduation from Washington, D.C.'s private Sidwell Friends School."